The smell of pumpkin-flavored coffee wafts towards you on a crisp morning breeze. Fuzzy sweaters, beanies, and scarves once again emerge from the depths of your closet. The days are getting shorter and the temperatures are getting lower. It’s that time of year again folks—fall. What better way to celebrate than by getting into the spirit with some of these adorable DIY and in-store Halloween decorations for your dorm or small space? Everything you need to know is right here… Just don’t forget the Command hooks. 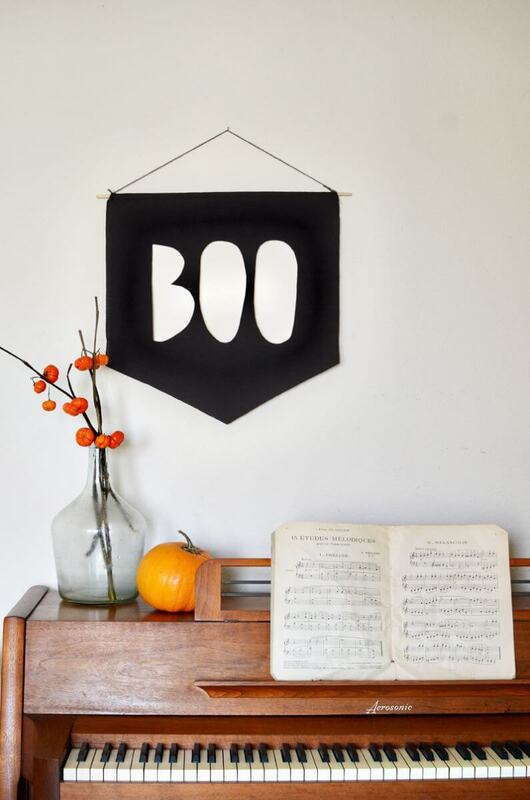 This adorable and easy felt banner has just the right amount of Halloween charm if you want to be festive without going overboard. 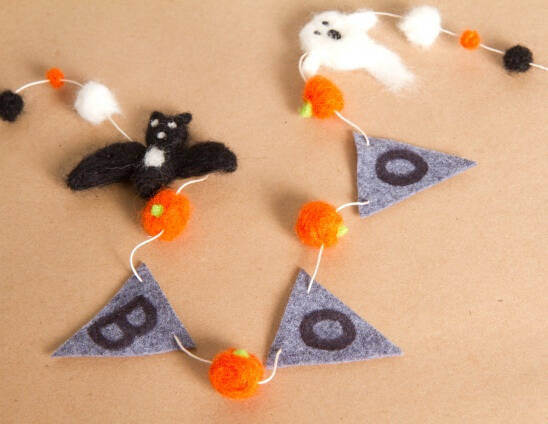 Pair this garland with colored string lights for cute—not scary—Halloween spirit. This is so ridiculously easy, can it even be considered a DIY? 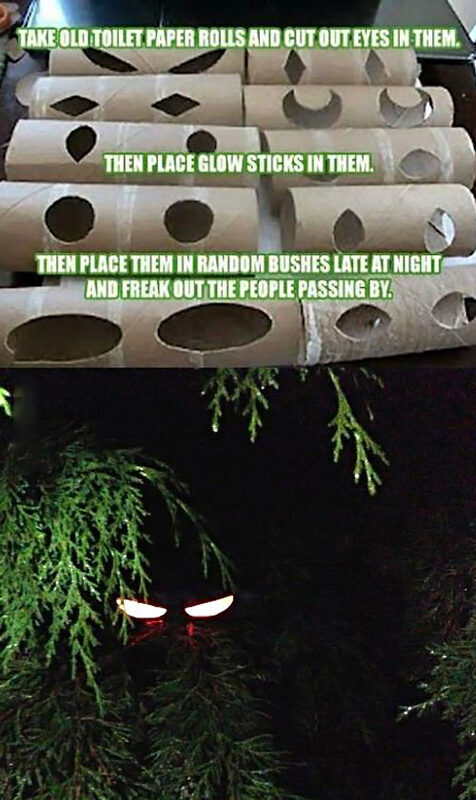 Just cut out the eye shape and put a glow stick inside the tube. 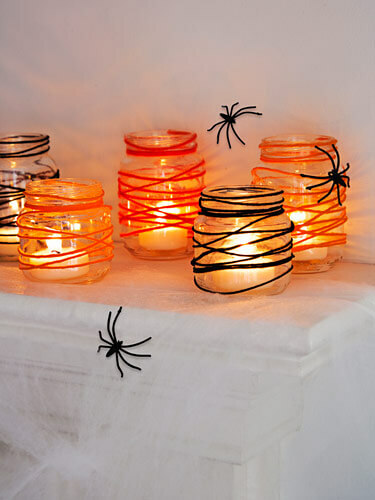 This Good Housekeeping spider-web inspired votive uses an LED tealight, so there’s no risk of a fire hazard! 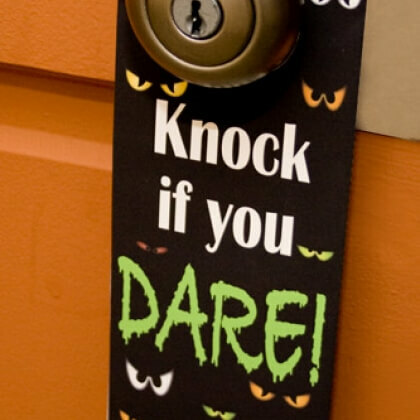 Perfect for your dorm when you just want a little Halloween pizazz without the risk of burning your building down or setting off that dreaded two a.m. fire alarm. 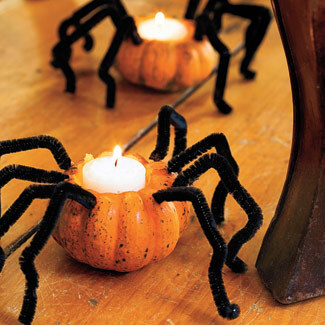 Mini pumpkins like these are perfect for small spaces where you can’t fit a regular pumpkin. You can carve out the stem in these the same way you do in a larger pumpkin, and putting a small pumpkin-scented candle in them is the perfect way to capture the scent of the season. Adding pipe-cleaner spider legs and black glitter gets you bonus points. 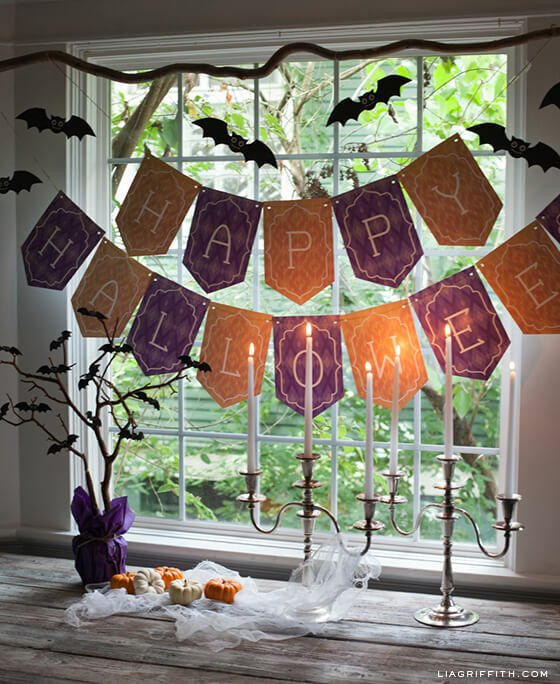 This beautiful Happy Halloween banner and bats are downloadable for printing. As long as you’re willing to sacrifice the printer paper and ink it’ll take, these make great dorm-door decorations. Cobwebs like these can be bought in all sorts of colors at any store that sells party decorations. 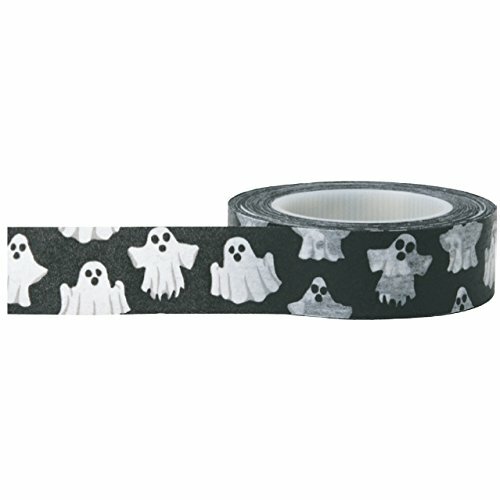 They’re extremely versatile and be stretched over doors, desks and windows or hung up anywhere to add some spook to your room. 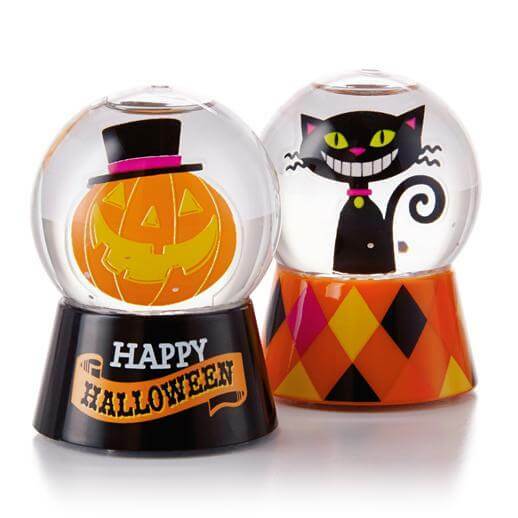 Decoration for your drink (and we all know you’ll be drinking come Halloween night). 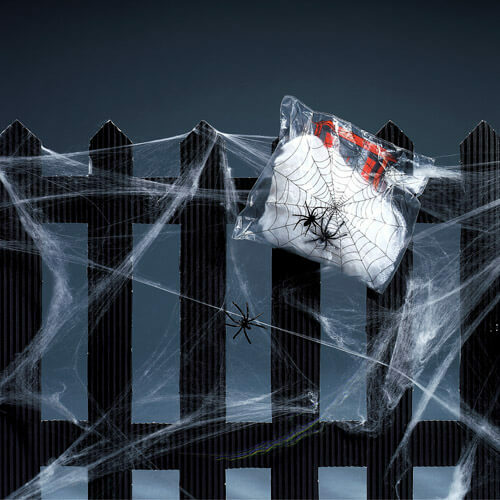 All you have to do is buy some plastic spiders (perhaps when you buy your cobwebs?) 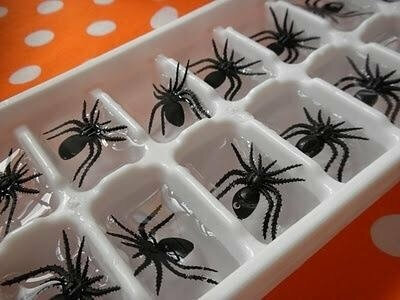 and freeze them in your ice cube tray with water (or the booze of your choice). If you’re feeling extra festive, add some purple or orange food dye to the water as well. 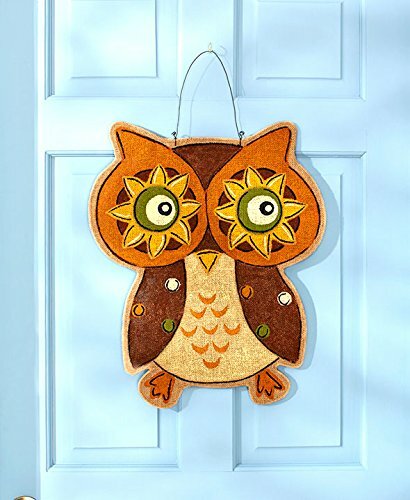 Not sure if this would be smart to put up without your roommate’s consent, but it’s cute nonetheless. And, just brainstorming out loud, but this would make a fantastic alternative to the classic sock-on-the-door scenario. 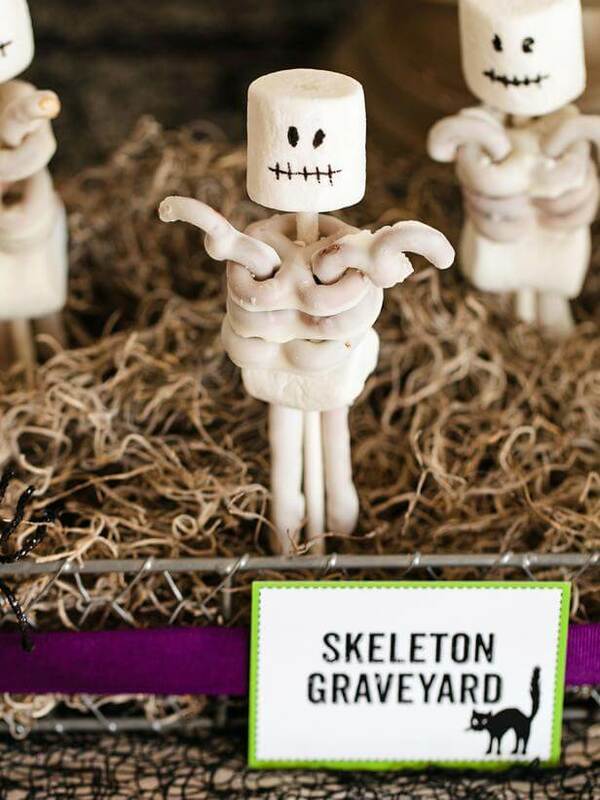 If you’re hungry, these white chocolate-covered pretzel and marshmallow skeletons do double duty as decorations that you can eat. And, it’s a kid’s craft, so how hard can it be? Cut out any festive shape you want and tape it to the inside of your lampshade. 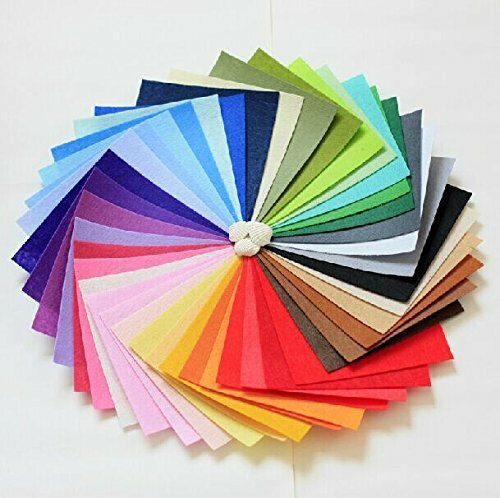 Doesn’t get much easier than this, as long as you still have paper after printing your banner. 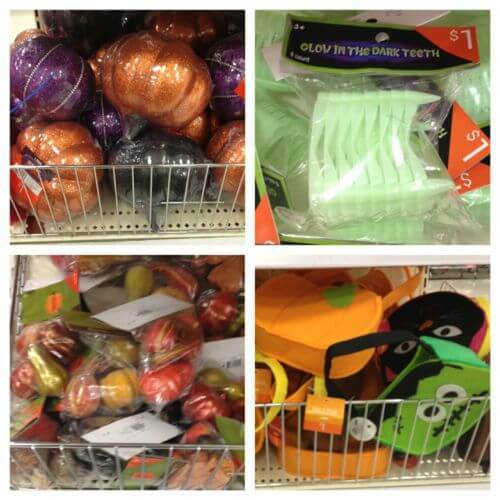 The Target Dollar Spot has a ton of fun and easy Halloween-themed products right now. From bowls and little buckets to wooden “Happy Halloween” signs and Halloween bingo, there’s sure to be something that you like, and it’s all college-budget appropriate a.k.a. cheap. If you’re feeling really crafty and bats and pumpkins aren’t really your thing, try one of these fantastic fall wreaths from The 36th Avenue. If you’re not good with your hands, many stores sell premade wreaths, like this one from Amazon. With all of the great DIY and purchasable Halloween decorations here, hopefully you can get yourself in the spirit despite being away from home. Adding a little festivity to your room will make studying for those midterms a little less awful, or, at the very least, a lot more stylish.